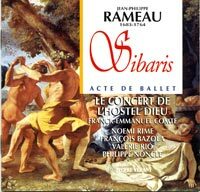 Description: This acte de ballet dates from 1753 and, in its confrontation between the sybarites of, well, Sybaris of course, and their war-like neighbors of Croton, allows Rameau to paint musical portraits of each side in the struggle: flutes anchor the arias (with many languorous vocalises) and dances of the Sybarites while their opponents are characterized by oboes and trumpets. French-English texts. Le Concert de l'Hostel Dieu; Franck-Emmanuel Comte. Original 2000 release.